Viewing topic "Backup of data—Saving / Loading Data (File Mode)"
The manual talks about backing up MOX data onto a USB thumb drive (p.57). I have a product called Mobilizer (by Line 6) that does MIDI backup into an iPhone app, but uses the MIDI out of the keyboard for the dump, not USB. I need to do a hard reset on my MOX8, and so I need to have all my settings backed up. My question is, can I use the same procedure as the manual describes but instead of backing up all data onto a thumb drive via USB can I send it to the MIDI Out instead? Is there something I need to do to direct it to MIDI Out rather than USB? There’s no way to direct the saving of an “All"/.X4A file to MIDI. ...but read the documentation before assuming that will do what you need. There’s also the John Melas software. ...but many are discontinued. However, others not on the list might work. If for some reason you can’t use a flash drive, and the other approaches for backup aren’t satisfactory, perhaps a factory reset can be avoided. Why is the reset necessary? Thanks for that answer. To answer your question why I feel I need to do a hard reset—the problem that started me on this journey was as follows: I am running the MOX8 through a MIDI interface (MOTU 828) into a Mac running Logic Pro. When using the MOX as the MIDI controller to play samples in Logic there was a single note (the “A” below middle C) that would not send a MIDI off message to Logic (one can see that quite clearly on logic). So that note would just sustain. It didn’t matter which sample /patch in Logic I chose, an organ, a guitar). It is always that note, never another, and is all the time, not intermittent. Resetting the entire system made no difference. When I played the MOX stand alone (say through headphones) the note stops when released. When I switch keyboards, (i.e. I plugged the MIDI out chord that was in the MOX going to the MOTU 828, into a second keyboard instead) the problem did NOT occur on Logic. That is, when using the second keyboard the “A” MIDI Off message is sent when releasing that note, and that second keyboard works fine with Logic. So I figured it must be coming from the MOX. Here’s the odd part (to me, anyway). When I run the MIDI out from the MOX into the MIDI In of the second keyboard, and listen to the second keyboard via headphone jack, the note (on keyboard 2) stops sounding when I release the key (on the MOX, which is in this setup controlling keyboard 2). So the MOX seems to control a second keyboard without that sustain problem. So sending a MIDI Off to the keyboard 2, but NOT to Logic? I have no idea where to start here. So… my best guess was some software glitch in the MOX, and hence I thought a hard reset might help. This should likely be a seperate thread, but since you asked. Any help would be greatly appreciated. 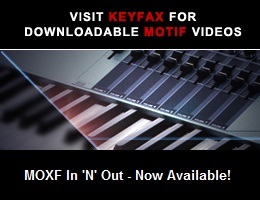 The MOX is blameless, indicated by the fact that its own tone generator has no problem with note-off for that key, as well as that a second keyboard responds correctly to the MOX’s MIDI-Out. ...which although it describes a note-on problem, might be what you’re dealing with. I’ll try that first chance I get. The post was suggesting go to Controller Assignments and delete an assignment for the specific note not working. This is a bit above my head in understanding, but I can certainly try it. I guess what confuses me is why both he and I have the experience that when substituting different keyboards, keyboard 1 has a problem with a note, and keyboard 2 does not, yet it’s not the keyboard 1 that’s the problem (even though keyboard 2 worked fine). How does logic know which keyboard is sending MIDI data to it if on the same MIDI channel, and chose to ignore one keyboard but not the other? Wouldn’t Controller Assignments be global for whatever keyboard was sending MIDI data to that specific note? I suppose pat of my not understanding has to do with not knowing what “note assignments” in the Controller Assignment window actually are. Different keyboard models can certainly be identified via MIDI. I don’t use Logic, but apparently each MIDI controller used with it can have its own assignments. If you aren’t able to resolve the issue using the information in the thread I linked to, you might want to ask in a Logic forum. What’s happening is definitely not a problem with the MOX. Please let us know what you determine. I am incredibly grateful for both how SMART you are, your ability to track down the relevant posts by others, and how kind to be so helpful. Below is a screen shot of my Controller Assignments window (in Logic Pro 9). I deleted the top entry and the problem resolved. How in the world that assignment got “learned” is a mystery. Regardless, on that single note the MIDI-Off message was somehow assigned (to nothing) and so no longer worked to provide the MIDI-Off message. And this note assignment was apparently specific for the MOX8 only, as other keyboards sending MIDI to Logic Pro 9 did not have this problem with the same note. Thanks for your very kind words. As I’ve said before, I enjoy solving mysteries. The above is in hexadecimal. The first byte, “90” is status, indicating Note-on Channel 1. The next two bytes are data - “39” is the note number for A2 (see http://www.somascape.org/midi/basic/notes.html), “00” is the velocity. A MIDI Note-on message with zero velocity is the same as Note-off. So “90 39 00” is Note-off for A2 on Channel 1. Since I don’t use Logic Pro, I’m not sure what the significance of the additional Note-off messages is. Perhaps someone with Logic Pro experience can let us know. You’re welcome! I’m glad the problem has been resolved.